I first came to Beirut in 2007. I was struck, at the time, by the lack of homelessness in the city. One could walk from one end to the other and see far fewer people sleeping rough than on a similar walk in London, or Paris. The same was true, if not more so, of Damascus. Now, eight years later – half of those years lived in Lebanon and Syria – life in the city has changed. Slowly, in late 2011, residents began to meet women begging under motorway bridges, saw the ranks of men waiting for temporary work on the roadside swell, and most noticeable were the children everywhere living the lives of adults: selling roses, washing windscreens, hawking ten packs of superglue or beard trimmers or a plastic gadget, sleeping rough. One hot summer’s day two years ago, I walked past an old Syrian man rooting through one of the open rubbish skips that line Beirut’s streets: an increasingly common sight as revolution degenerated into war across the border. But this time, something caught my eye. The man was studying a shampoo bottle half-filled with scented liquid. He smelt it; he raised it to his lips, took a sip. He did not spit it out; he stored it in his pockets for later. The sight of someone savouring artificially flavoured hair products for nourishment seemed somehow emblematic. Then one Saturday night in mid-winter, I was hopping from bar to bar with friends and almost tripped over a young boy, no more than 6 years old, lying stone cold on the floor with only a jumper to keep him warm. For a full minute, we shook him, shouted, but he did not move. His body lay prone on the floor. A minute is a long time to try to wake somebody. He finally opened his bleary eyes, and called for a blanket. We spent some time with Hussein – that was his name. He said he was alone, that he came from Aleppo. He wanted to return to find his family in Syria. We tried to find him a shelter, to find support for him through a charity; there were none that could take him in. He attempted the comportment of a grown man – gruffly acknowledging the eggs I cooked with a traditional phrase of formal thanks. But when he awoke from sleeping he mistook me for his mother and his eyes filled with tears, his learnt adulthood falling away. There are now up to 2 million Syrian refugees in Lebanon (including those who are unregistered by the UN), of which the great majority of adults do not work. 630,000 of registered refugees are school-aged children (the total including unregistered refugees is estimated to be significantly higher); 66% of those children have no access to any form of education. The scale of the tragedy is overwhelming. Added to this is the plight of the Palestinians in Lebanon. Those who have recently fled from Syria are now refugees for a second time, and face the prospect of building a life once again in ever more crowded camps squeezed onto a kilometre of land assigned to them 60 years ago to house a fraction of the number of Palestinians now living in them. Those whose families have been living in Lebanon’s refugee camps for up to three generations are little better off, remaining refugees without Lebanese nationality or full rights even though Lebanon is often the only country they or their parents know. The limited aid that exists is now focused squarely on providing for refugees from Syria, those facing the “biggest humanitarian emergency of our era” says Antonio Guterres, UN High Commissioner for Refugees. Increasingly, the Palestinians in Lebanon are forgotten, even though their living space and conditions worsen by the year. I am an arts producer and practitioner, rooted firmly in the art world and not the world of development and NGOs. But moments like the one I shared with Hussein, which surround our daily lives in Beirut, have left me with little choice but to engage with the refugee crisis in a direct way. Today, four British and Lebanese artists and teachers as well as myself will come together to initiate Seenaryo, a theatre project and training programme with refugees in Lebanon. We will spend a week in Shatila, the Palestinian refugee camp in Beirut, hosted in a UN school by a self-organised troupe of Palestinian scouts. The second week we will be in the Beqaa Valley, building a show with a group of Syrian children in a centre run by the Syrian association Women Now. Women Now was founded in 2012 by Syrian novelist Samar Yazbek to support micro-businesses and the development of skills for Syrian women. The organisations empowers them to support their families, avoiding the early marriages that have already been the fate of many young Syrian refugee women. 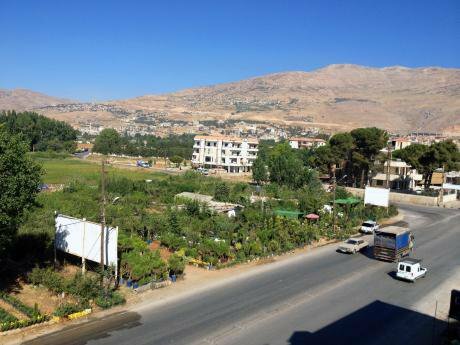 The view from Women Now’s centre in Chtaura, Bekaa Valley. Copyright: Seenaryo, August 2015The Seenaryo project is initiated entirely independently of a wider organisation, and comes out of a series of conversations over a long period of time with members of grassroots refugee organisations in Lebanon. It is unambiguously a theatre project; and this fact, in the current context, leads to a fundamental question. Why insist on a cultural project when the urgent need for basic humanitarian aid is not being met? Seenaryo will employ a collaborative mode of theatre making developed by UK arts organisation Upstage over the past decade, which is entirely geared towards empowering participants rather than teaching set structures. Starting from scratch today in Shatila, we will encourage our group of 30 children to play, improvise and write. From their ideas, we’ll shape a performance that includes specially-composed songs (with fully produced backing tracks), an original script and choreography, and a set designed by the children. 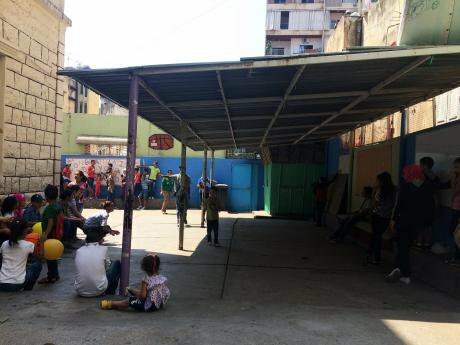 We’ll be accompanied by three trainees from Shatila – young adults interested in theatre – who we will train so that eventually, perhaps a few years down the line, they can lead these “showbuilds” themselves. Next Friday, the group will perform their show to a local public. I could attempt to define the value of Seenaryo as an educational project – and leave it open to the accusation that basic literacy and numeracy are far more important for a child’s education than building a play. I could defend Seenaryo as therapy – and be left asking how we can hope to address the causes of traumas we cannot begin to apprehend. I could try to quantify the impact that this work has: the transformative power I have witnessed working with Upstage with young people in the UK in bringing groups together, and confidence to individual children. But as it was the scouts themselves who invited us to initiate this project with them in Shatila it makes more sense to consider this project from the ground up, rather than strictly through theory. It is scorching hot and humid in the summer. Up to 20,000 people live on a piece of land of one square kilometre. The camp’s population has more than doubled since the start of the Syrian revolution with Palestinian refugees from Syria. There is little to do – school is out, and indeed the UNRWA-funded schools in Lebanon, including the scouts’, have shut due to lack of funding and are not due to reopen until 2016, disrupting the curriculum for thousands of children. Spaces to play are practically non-existent: there is no free space. And to boot, this summer Beirut is in the midst of a rubbish disposal crisis, the result of which is mounds of trash piled building-high on every corner, so that some of Shatila’s narrow alleys are unpassable. In this context, the opportunity for children to work intensively for a week, and for the trainees to build leadership skills for the future, is a precious one. When I met the group of children last week, their enthusiasm was palpable. In the Bekaa Valley too, where the project will continue next week, whilst the women work, their children will be with us, developing a different set of skills. That Friday, the group will perform their show to a local public. Aid for Syrians all too often goes one of two ways: on the one hand, to Islamist charity that imposes cultural conditions and restrictions on its recipients, all too aware of the power of culture in the battle for Syria. On the other, international development agendas that risk flattening all refugees into a subclass of reliant victims. The infrastructure in Lebanon remains unfriendly to small-scale cultural work. But if it is true that, in the words of cultural theorist Stuart Hall, “culture forms the raw material out of which politics is made” – that it is the strongest tool of resistance to hegemony – then it is essential to work on cultural projects, in collaboration with and responsively to the needs of grassroots organisations. It is key to train young leaders in cultural skills and to work with children on art projects in a participatory way. Only then can young people begin to navigate their way through these crises. Seenaryo is in partnership with Syrian organisations Ettijahat and Women Now, and the Yaabad Scout Troupe.